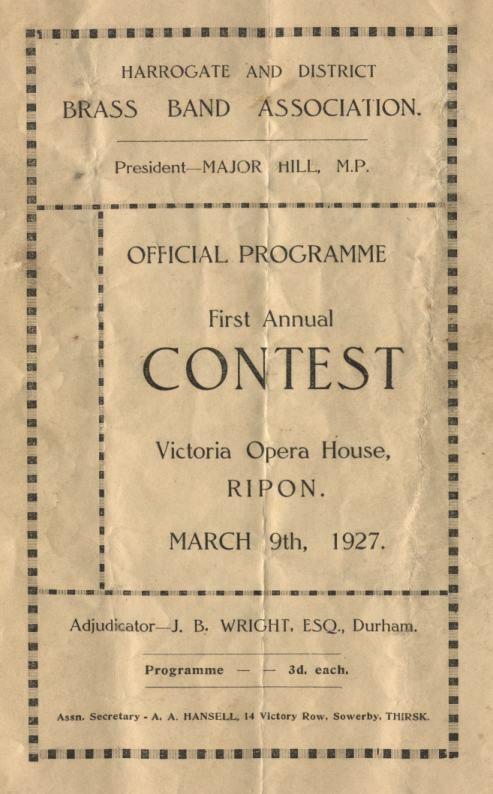 Harrogate and District Brass Band Association, First Annual Contest, Victoria Opera House, Ripon, March 9th, 1927. Adjudicator JB Wright. Harrogate Silver Band, conducted by Geo. Todd won 1st place in the selection, together with all the medals, and 2nd place in the march. Harrogate Borough Band, conducted by H Breadon, came 6th in the selection and 4th in the march. 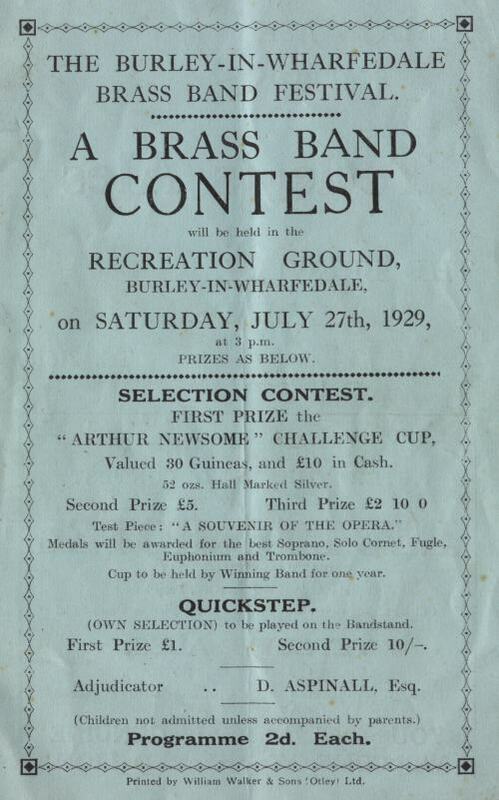 Burley-in-Wharfedale Brass Festival - Brass Band Contest held in the Recreation Ground at Burley-in-Wharfedale on Saturday July 27th 1929, at 3p.m. Test piece A Souvenir of the Opera and Own Selection Quickstep (played on the bandstand). 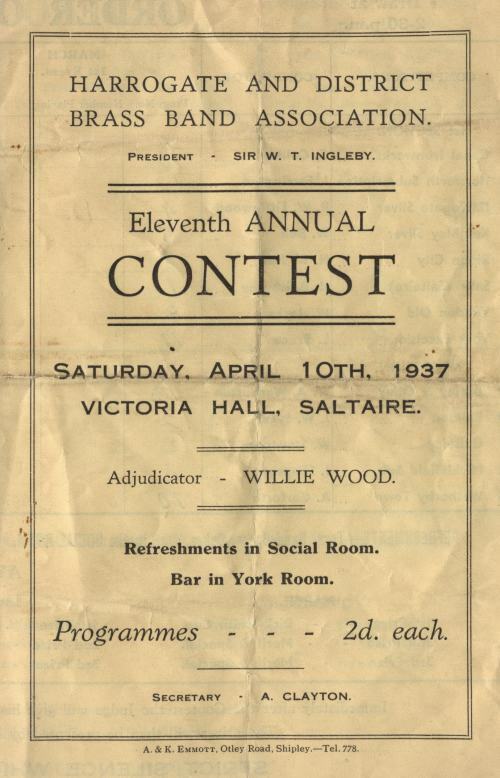 Adjudicator, D Aspinall Esq. 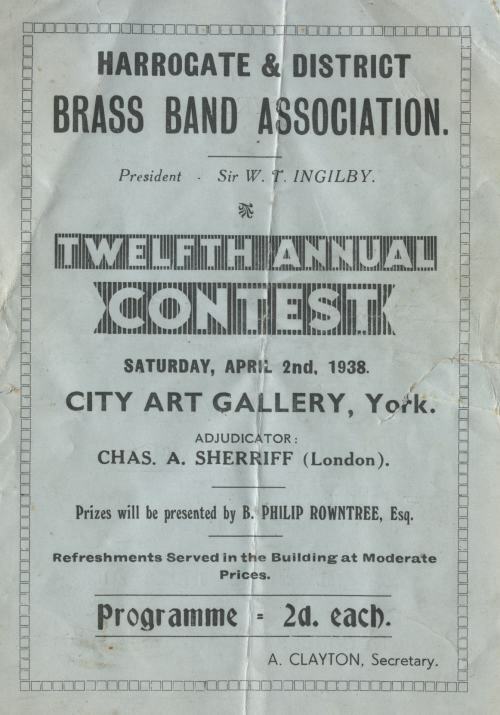 Harrogate Silver Band, conducted by W. Sidebottom, gained second place in both competitions, being beaten by Bullcroft Colliery Band in the test piece, and Yeadon Old Brass Band in the Quickstep. 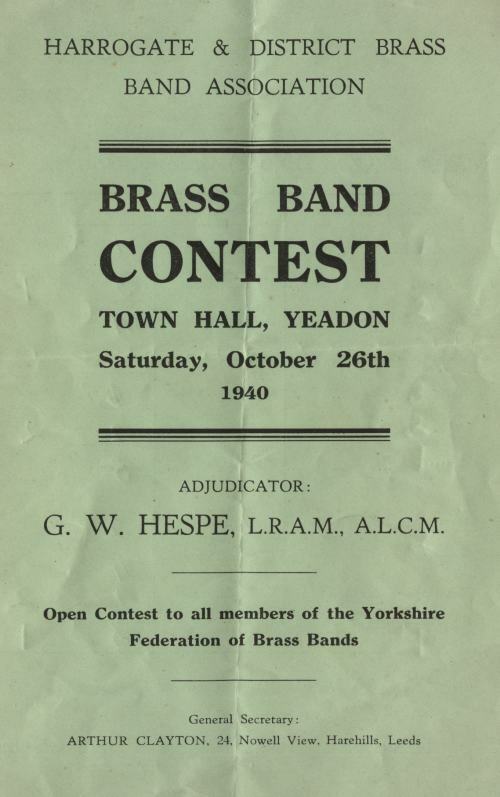 Harrogate and District Brass Band Association, Brass Band Contest, Town Hall, Yeadon, Saturday October 26th 1940. Adjudicator, GW Hespe. Harrogate St John's Ambulance Band, conducted by LN Shutt, competed in the 1st Section. 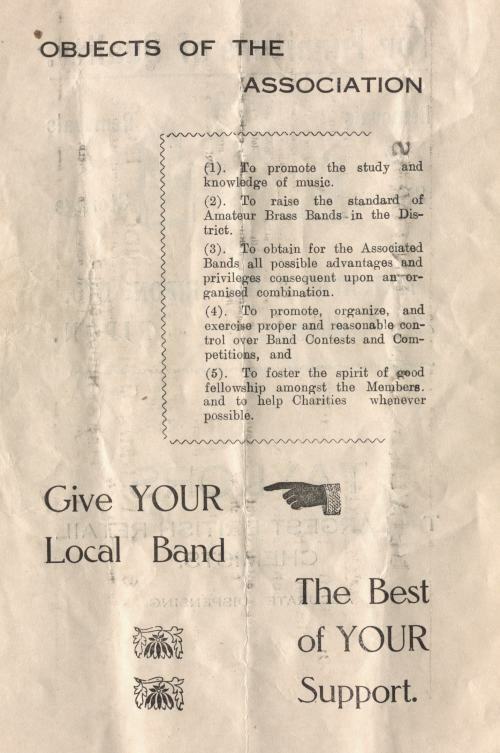 They were not placed in either the own choice "Chorus" or "Selection". 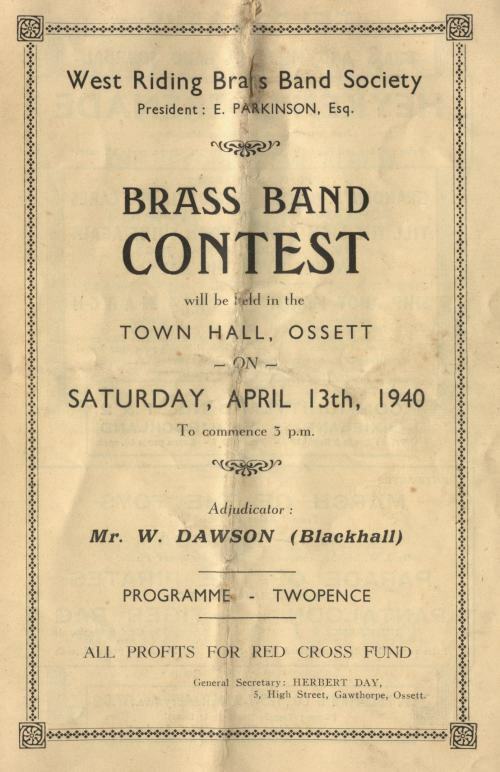 West Riding Brass Band Society, Contest in Ossett Town Hall, Saturday April 13th 1940, at 3 p.m. Adjudicator, W Dawson. 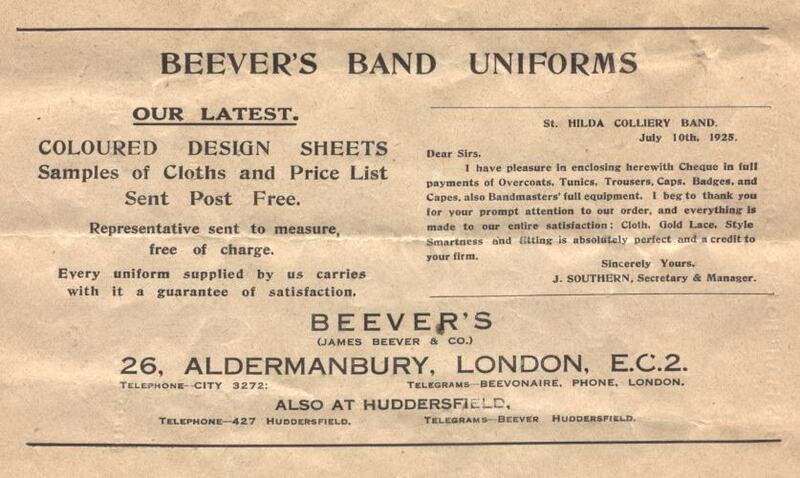 Harrogate Silver Band, conducted by L Shutt, competed in the 2nd Section contest (march, hymn and test piece - Echoes of Schubert, Hawkins) but did not get placed.